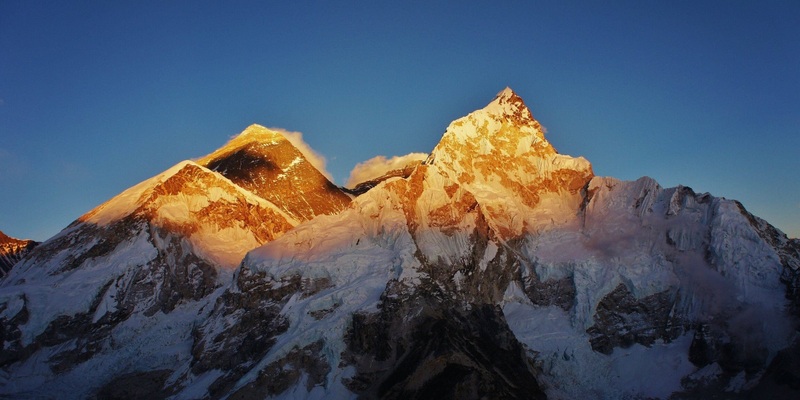 FAQ: How Much Earlier is Sunrise on Mount Everest Due to Elevation? How Much Earlier is Sunrise on Mount Everest Due to Elevation? The greatest sunrise and sunset elevation effect on Earth is on Mount Everest (at 27.988056 N, 86.925278 E as seen on the Direction to Yerushalayim Map). With an elevation of 8,848 Meters (29, 029 feet), sunrise would be up to 15 minutes and 31 seconds earlier on Mount Everest than on sea level. The range of the effect is from 15 minutes and 31 seconds on June 22nd, to a “low” of 13 minutes 41 seconds earlier on March 18th. Being in a large mountain range with obstructed horizons, it is likely never actually seen that early. In addition to questions about mountains, every few months I get asked about how much earlier sunrise/set can be seen in skyscrapers. There are various halacha questions as to whether this actually affects zmanim that I will mention later. Here are some raw numbers. Burj Khalifa (at 25.197222 N, 55.274056 E as seen on the Direction to Yerushalayim Map) is the tallest building in the world. With a height of 828 m (2,717 ft), visible sunrise to someone standing on top of the crown (something unrealistic) on June 22nd would be at 5:24:56 AM versus 5:29:31 AM on sea level, a difference of 4 minutes and 35 seconds. Sunset would be 7:16:35 PM versus 7:12:00 PM at sea level, a difference of 4 minutes and 35 seconds. A more realistic scenario would be the visibility sunrise on the highest floor (the 160th) , an elevation of 672 m at 5:25:23 AM, a difference of 4 minutes and 8 seconds earlier than sea level. Sunset on the 160th floor would be 7:16:08 PM, or 4 minutes and 8 seconds later than at sea level. ויש להוסיף שהוא דבר תמוה לומר דעד שלא נבנו הבנינים הגבוהים היה זמן שבת התלוי בשקעה”ח (שקיעה ראשונה להגאנים ושקיעה שניה לר”ת) מוקדם, ולאחר שנבנו יש לאחר הזמנים, ועד עכשיו שהיו בניו יארק הבנינים התאומויות (טווין-טאוע”ר בלע”ז) שכל א’ מהם היה בת ק”י קומות היה זמן השקיעה מאוחר, ועתה לאחר שהפילו והרסו אותם רשעים וזדים ארורים ימ”ש חזר הדבר לקדמותו להקדים זמן השקיעה. is there any direct formula or program that we can use to calculate the delay time in sunset because if height and elevation over sea level. we should take into consideration the latitude and sun deviation from solstice. The calculation is rather simple and involves adjusting the zenith from 90° (plus solar radius and refraction) to something a drop greater than 90° to adjust for the elevation. The formula can be seen in the source code of the AstronomicalCalculator.getElevationAdjustment(double elevation). Since the general sunrise and sunset calculations account for the time of the year, the calculations should be accurate. I cant make use of the page u sent. I would need latitude and longitude for such a calculation, and it differs by the day of the year. To get the calculations yourself, go to https://kosherjava.com/zmanim-project/zmanim-calendar-generator/ , set the location and adjust the elevation. While most of the times will be irrelevant for you, the sunrise, sunset and elevation adjusted versions of them are what you are looking for. We are working on the issue, and I expect it to be back up in the next 12-24 hours. Things were back to normal about 8 hours ago. what does Misheyakir 10.2° mean?